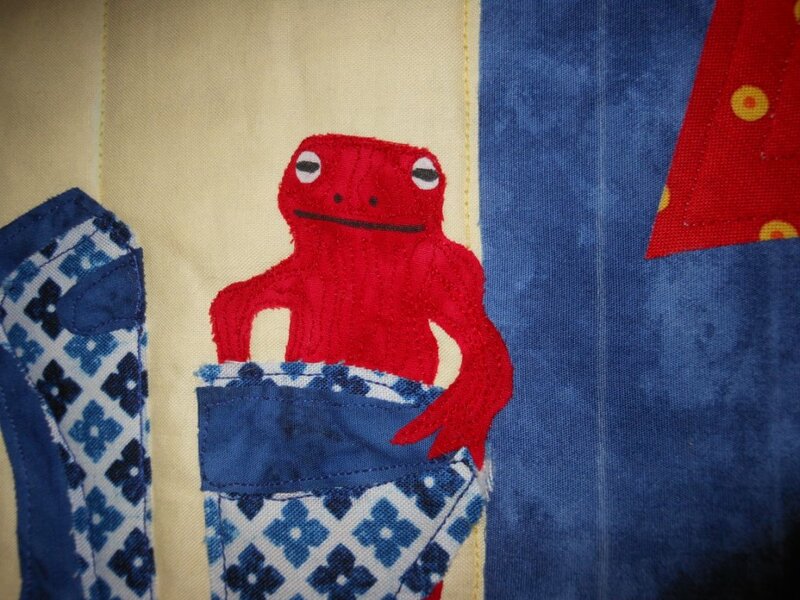 Progress has been made on the Newt quilt. Saturday I got it all fused together and started quilting it. I am done with the majority of the quilting, I didn’t want to make it too visible because the quilt already has so much going on. But I do think I need to do a little more in the background/wall. Make a little bit of a pattern back there so it isn’t too flat. 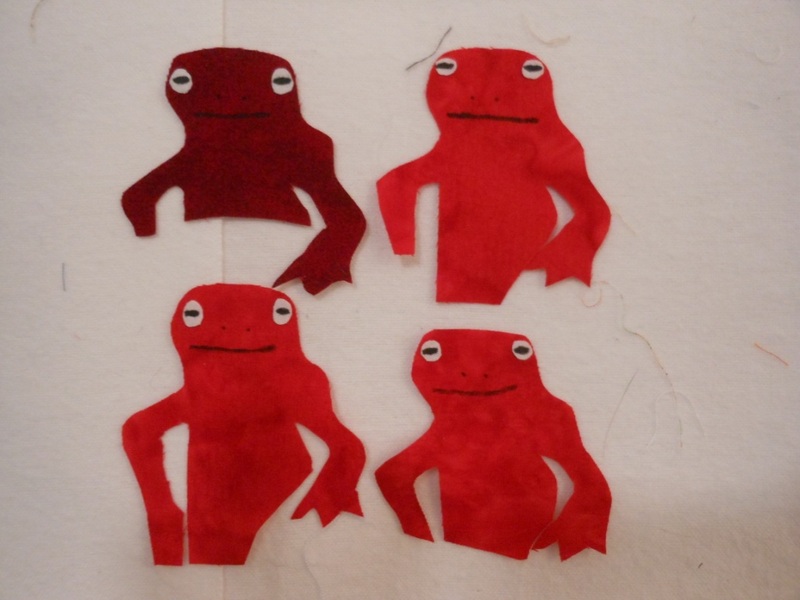 I had to make 5 of those darn newts until I got one I liked. I would get their teeny tiny fiddly eyes fused on, and then I would draw the mouth, and I wouldn’t like it. #1 too dark of a tone of red. #2 too glum. #3 too, I don’t know, smug? He looks irritating. #4 Too happy. Too much like Kermit the Frog. The eventual winner. I think he looks mostly neutral, perhaps a bit perplexed. Ken also pointed out his head was too round and that was making him look like Kermit, so he got a trimming. You can still see some quilt marking lines here. I also need to add a tassel onto the end of the tapestry. 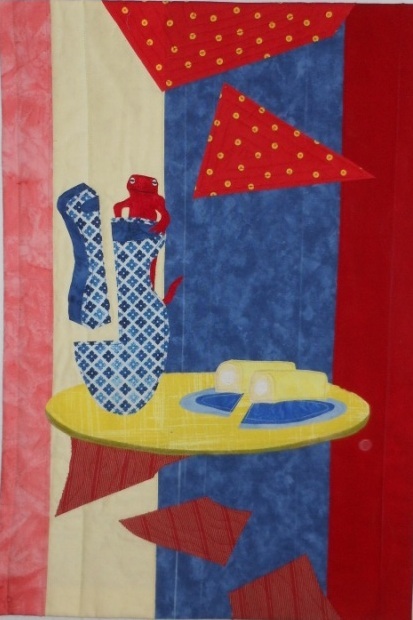 I wish the Twinkies stood out more from the table, I quilted the heck out of them so they would show more than their surroundings. I would really like to get the fabric paint and add texture to the creme filling but I think I will resist. Had to have this mostly done this weekend because I am going to be gone on work travel a good part of this week. Cute newt! I liked the first one, but if you didn’t like the color, I could see why. I would say that you nailed the newt.